Forget the dull and the drab; inside the real Vancouver flows an electric entertainment scene, a fast lifestyle, and a young, vibrant population who knows what living is all about. The best place to find all of these elements? At the heart of the city's downtown core, the Roxy. Every night of the week, bands are pumping live music through the Roxy's veins. From Sunday to Tuesday, Joe's Garage keeps your motor running with pure rock and roll. Troy's R Us is now shakin' up Wednesdays, Thursdays and Fridays, dispensing high-energy top 40 tunes to give you a boost. Each band shares the stage ever other Saturday. Every night of the week means live music, dancing, and the best-looking crowd in the city. Not to mention lots of pool tables, TV's, celebrities, performance bartenders, and Vancouver's hippest staff to get the pulse racing. Want to make the Roxy's beat your own? Book your event with us and you'll be the lifeblood of the party, whether it's a staff social, stagette, fundraiser, CD release, or whatever. You pick the pace, and we deal with the details. Industry Mondays! Because we know you guys never get a weekend! We love Mondays! you get Vancouver’s best band, industry clientele, and room to move. TATTOO ALIBI is our newest house band armed with fresh tracks to get the dance floor jumping! Bring your pay stub from any local hospitality provider for free entrance. Tuesday Night @ The Roxy are our CAN-CON nights. Canadian Content is not about garage bands getting their shot at making noise. It’s about serious players showcasing their craft in front of managers, agents, record executives, and critics. We are proud to have had a hand in launching the careers of some of Vancouver’s most promising talent. First band is on at 8pm so make sure to come and check them out early. Following Canadian Content, which wraps up at 11pm, The Bulge takes the stage to please their audience with a high energy, fun and interactive performance that doesn’t stop till closing time. Wednesdays are pumped up with Live Music by Troy’s R Us. They are a seriously great; fun party band that know how to rock. With multiple vocalists that make for great harmonies and a mix of songs from The Monkees to the Foo Fighters to Gwen Stefani - Troys 'R Us know how to keep you and your friends entertained while you hang out and party it up! Let us host your next party or Fundraiser! It’s easy as pie; you can lay back and enjoy the party while we look after all the event arrangements. Thursdays rock your world with Live Music by Troys 'R Us. They are a seriously great; fun party band that know how to rock. With multiple vocalists that make for great harmonies and a mix of songs from The Monkees to the Foo Fighters to Gwen Stefani - Troys 'R Us know how to keep you and your friends entertained while you hang out and party it up! Let us host your next party or Fundraiser! It’s easy as pie; you can lay back and enjoy the party while we look after all the event arrangements. Friday is the night when Vancouver cuts loose and gets crazy. And, The Roxy is always here to serve with Live Music by Troy’s R Us. They are a seriously great; fun party band that know how to rock. With multiple vocalists that make for great harmonies and a mix of songs from The Monkees to the Foo Fighters to Gwen Stefani - Troys 'R Us know how to keep you and your friends entertained while you hang out and party it up! 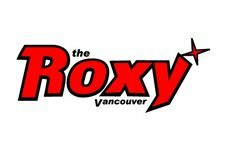 Guest list fills up fast, so make sure you email info@roxyvan.com or call 604-331-7999 early to book your group a spot at the voted best bar in Vancouver by the Georgia Straight. Saturday is the night to be down at the Roxy for great tunes, and great people. Live Music by Joe’s Garage. From Tom Jones to Nirvana, Garth Brooks to Pink Floyd, Bob Marley to Def Leppard. They play it all! And, always with a huge grin on their faces and a high energy party hearty attitude in tow. Hits from the 60’s thru to today, whatever you want to hear, they’ll crank it out. Guest list fills up fast, so make sure you email info@roxyvan.com or call 604-331-7999 early to book your group a spot at the voted best bar in Vancouver by the Georgia Straight. City slickers, leave your saddles at the door… The Roxy’s Goin’ Country Every Sunday Night! Country music, girls, beer and good times! Featuring The Roxy’s very own “Midnight Cowboys” aka Joe’s Garage live! Enjoy a night filled with Country flare --- yee haw! Industry Courtesy in full effect.